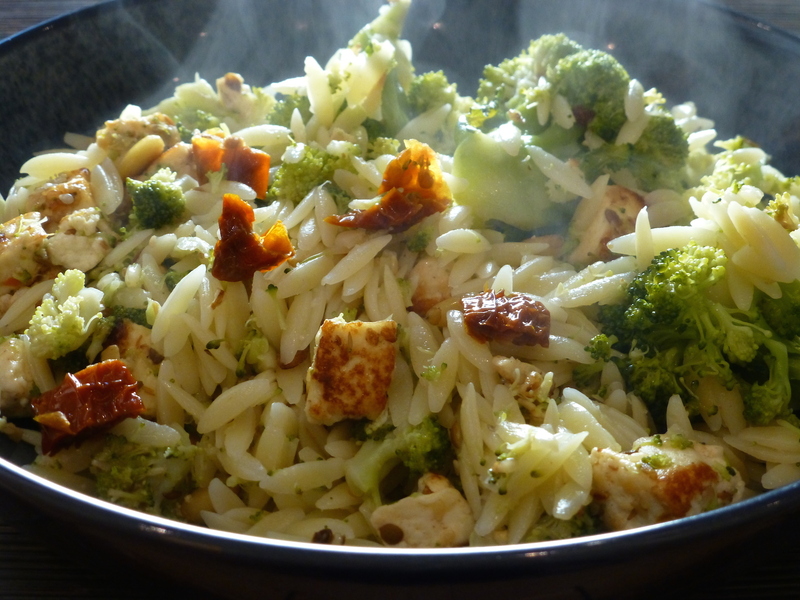 Orzo with broccoli and paneer • Quick & Tasty - Get Cooking! This is a surprising combination of orzo (pasta shaped like grains of barley) with steamed broccoli and stir-fried paneer (fresh Indian cheese). Cook the orzo just like regular pasta. Soak the dried tomatoes in boiled water for about 10 minutes, then chop up into pieces of about 0.5cm. Wash the broccoli. Divide into florets and steam them. I cook them in the microwave for 5 minutes on full power (900W); I use a pot with a small insert, similar to a steamer basket, so that the cooking liquid can drain. Stir-fry the paneer with the spices, ginger and pine kernels over medium to high heat, until the paneer starts to brown a little. Add the soya sauce, then the broccoli and the soaked tomatoes, fry some more over low heat. Drain the orzo and add to the pan, drizzle on garlic oil and serve.